BANGOR, Maine — The University of Vermont men’s basketball team displayed why it was the preseason favorite in America East on Wednesday night, handling the University of Maine 73-49 at the Cross Insurance Center. Vermont improved to 12-4 overall, 2-0 in conference play while scoring its 15th straight victory over UMaine. The Catamounts now lead the series between the teams, which began during the 1949-1950 season, 71-70. UMaine suffered its sixth straight defeat and fell to 2-15 overall, 0-2 in the conference. America East preseason co-player of the year Anthony Lamb and freshman guard Robin Duncan — one of three Duncan brothers on the roster — led a balanced Vermont attack with 11 points each, though Lamb was held 10 points below his season’s scoring average. Nine different Catamounts scored at least six points while Vermont shot 54.5 percent (24 of 44) from the field and 83.3 percent (20 of 24) from the free-throw line. Vermont also committed just nine turnovers compared to 14 for UMaine. 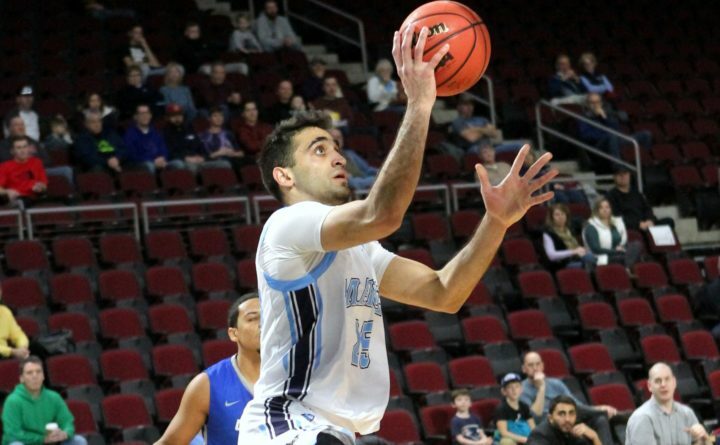 Junior guard Sergio El Darwich led UMaine with 16 points and eight rebounds while junior guard Isaiah White scored 11 points and junior forward Andrew Fleming added nine. Vermont limited the Black Bears to 33.3 percent (19 of 57) shooting from the field, with 28 of those attempts coming from beyond the 3-point arc where the Black Bears made just 28.6 percent. UMaine took just eight free throws, making three. “I felt like we made progress tonight,” said UMaine coach Richard Barron. “I hope our guys have a sense that you’ve got to walk before you can run. We executed better, we were more deliberate, we were more intentional. We didn’t do it with the same comfort level that Vermont did, and Vermont’s probably a little further along in terms of their recognition of where their shots come from and being prepared for them — that level of confidence that comes from having done something before. Vermont spotted UMaine a 3-2 lead on a 3-pointer by Fleming 1:14 into the contest, then cruised to a 35-18 halftime advantage as seven different Catamounts scored at least four points despite early foul trouble that limited Lamb’s minutes. Vermont followed the first of Fleming’s two first-half 3-pointers with nine unanswered points to take an 11-3 lead four minutes into the contest. While UMaine rallied within 15-12 as its first four baskets all came from beyond the arc, Vermont soon took away that part of the game. The Black Bears missed their final nine 3-point tries of the half. Vermont scored 11 straight points while holding UMaine scoreless for an eight-minute stretch that ended with a drive by El Darwich with 3:07 left, but that only drew the Black Bears within 29-16. Vincent Eze opened the second half with a strong post move to draw UMaine within 35-20, but Vermont ripped off nine more unanswered points, beginning with a Stef Smith 3-pointer and concluding with a Smith fast-break drive after Ernie Duncan stripped the ball from Fleming at the other end to make it 44-20 with 16:20 left in the game. That advantage grew to as many as 32 points at 69-37 with 4:07 remaining after a 3-pointer by Ernie Duncan and two free throws by Bailey Patella.